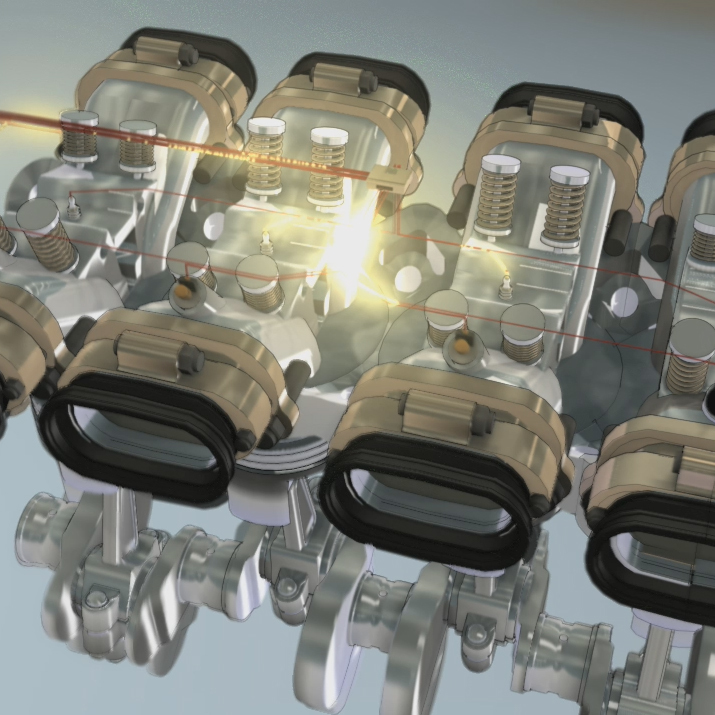 This model features a mixture of representational forms – the “cutaway” 4-cylinder gasoline engine – with a diagrammatic representation of electrical pathways running from the ECU to each fuel injector. The electrical current is represented with a stream of particles that have a glowing shader effect. The timing of the electrical impulses is an intricate matter. Each pathway from the ECU to its corresponding fuel injector is a different length. So each pathway has its own particle emitter that is timed to have an equal number of particles arrive at each fuel injector the moment the fuel injector begins to spray. Likewise, the moment the fuel injector stops spraying, the stream of electrical particles has to finish flowing into the injector. For both of these events to be timed correctly, the speed of the particles and the length of the pathway must be taken into account. The resulting animation runs very quickly, but watch it in slow motion and you’ll see the timing is accurate for the entire process.